Ever since J and I got married back in July of 1999, we have spent Thanksgiving with his folks in Southern Illinois. This year was different. His folks decided to visit J’s 94-year-young grandmother over the Thanksgiving holiday in South Carolina. So for the first time in 14 years we were home. 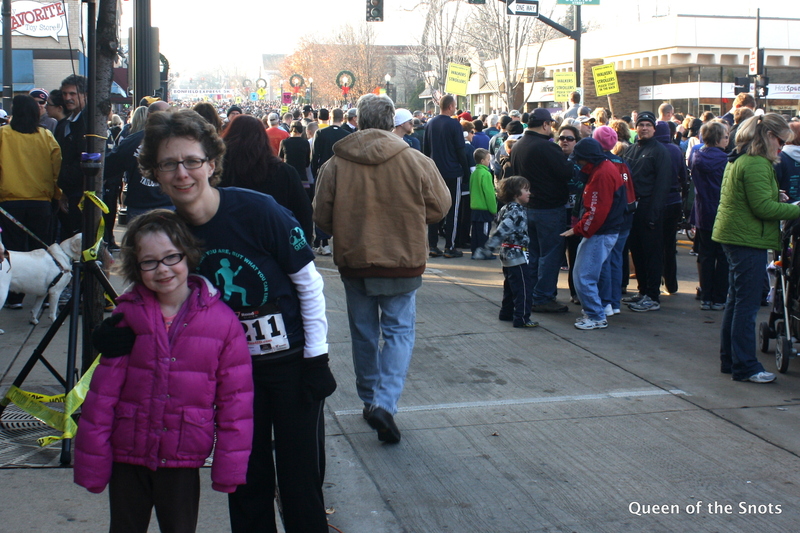 In our town there is an annual Turkey Trot through the downtown area on Thanksgiving morning. This 5K is held in memory of a man that worked at my high school at the same time I was there. The money raised for the “race” goes toward scholarships for high school students of character. As they state on their website: “The Bonfield Express Foundation is a fast-growing local charity working to build character and community commitment in high school students.”In the back of my mind I have always thought that it would fun to participate in this event. I think I also thought this because I knew I probably would never get a chance. So, the chance arrived. I then looked at the weather reports. When I saw that it was supposed to be in the 50s and probably the 40s for that morning (the race is at 8:30) I began to think more seriously about it. I told J what I was thinking. His initial response was “You are going to be totally beat for the rest of the day.” I told him that I wouldn’t run the whole way and that I have walked in many 5Ks in the past. I would be fine. So I took the plunge and signed up. On the Sunday prior to the race, I decided I better go buy some actual exercise pants since I had been walking/minimal jogging in my jeans up to this point. So after purchasing some good ole Target pants, I tried them out around the neighborhood. With the help of my fitbit I tried to go as close to the distance set for Thursday. I even tried to run most of it. This was a first for me. I took the plunge and was proud of myself for running longer than I had previously while taking periodic walking breaks. I was home in about 45 minutes and did about three miles. The day of the race arrives. A beautiful sunny brisk day. J and the girls come with me to cheer me on. We arrive at the event and meet 6,000 of my closest friends. Wow. Biggest race turnout yet. I attempt to get in front of the walkers. I decide I am going to try to run this thing as long as I am able. J and the girls go off to the coffee shop and plan on meeting me at the finish line. The national anthem is sung. All 6,000 voices are silenced. Then the race began. I am proud to say that I ran and I kept running. Didn’t even stop to get a drink of water or a donut (as some kind homeowner was passing out!) My jogging speed may have been the same as a fast walker but … I was running! It was so neat to see people coming out of their houses, banging their pots and pans and clapping/cheering us on. My end time was 43:41. Not too shabby. One last thing. Remember how J said I was going to be all tired afterwards? Guess who was the tired one on Friday and had to take a nap and all? I’ll just say it wasn’t me. Everyone loves receiving mail, especially when it isn’t bills! The girls get such a simple thrill when something comes in the mail with their name on it. With the craziness of life it is sometimes hard to remember our loved ones special days and so we deprive them of this little joy as well. That may seem a bit too harshly stated, but I do believe that with the advent of social media (I’m looking at you, Facebook) we think that just because we acknowledged someone’s birthday via a post to their ‘wall,’ we are good to go. Our work here is done, etc. Well it doesn’t have to be that way and Treat can help. Treat is Shutterfly’s exciting new greeting card brand that makes it easy for people to create and send one-of-a-kind greeting cards. Treat cards are perfect for holidays, birthdays, congrats, thank yous and every occasion in between. It’s crazy fun. It’s super easy. And it’s totally personal. Do you have a special someone in your life that would love to receive a card in the mail? Treat will help you personalize and tailor that special card to make it just your own. And since it is a Shutterfly brand you can be certain that you can include your pictures on the card as well. Want to give Treat a try? For FREE? Of course you do! Just check out their many selections and pick out a card and make it your own. Then enter the code TREATBLOGR in the coupon code box. This coupon is only good today, November 19th and tomorrow, November 20th, so go there now before you forget! Think of the smile, think of the love.. I was provided with free cards from Treat for this post, but the opinions expressed within are completely my own. I was asked by Shutterfly to share with you something neat that they are currently doing over on their Facebook page. Right now, in honor of Veteran’s Day this upcoming Sunday, Shutterfly will send a customized card on your behalf (and at no cost to you) to a person currently serving in the military. They are attempting to send a card to every single one of these dedicated people. Won’t you do your part? Go to Shutterfly’s facebook page and “Like” them if you haven’t already. Pick out your card (below is a sample of the four choices) and personalize it however you want. You can even add a photo if you wish. Click send and Shutterfly does the rest! My brother-in-law and his family are currently proudly serving our country. Words can not express how appreciative I am for their sacrifices for our safety. Sending a card is a small way of paying back that ever-lasting debt of gratitude. This is a sponsored post by Shutterfly but all statements are mine. After a summer hiatus, I have shaken things up in my little corner of the internets. 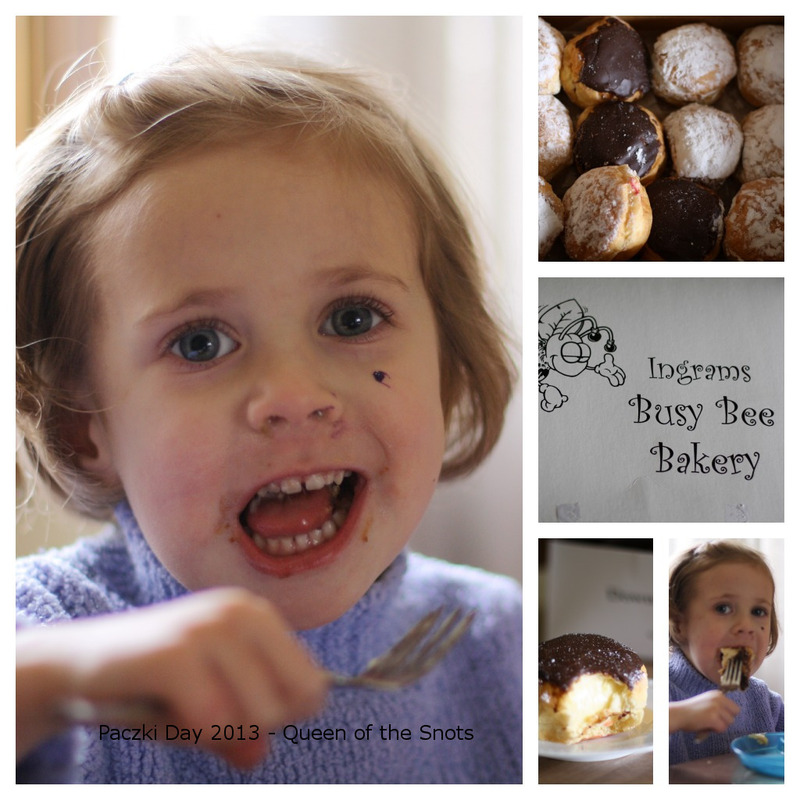 For one, we have a name change – Queen of the Snots as opposed to the former Queen of the Snot Princesses. As my girls are getting older, I saw them liking less and less the “princess” label. I want this space to be one where I not only document their growth but mine as well. Hence the name “Queen of the Snots.” While my girls can be “snots” some times, there is also many snotty moments in my life where I am also the snot. So as my tagline suggests, I might as well own it and relish it. I hope to post more regularly to this space than I have had been doing on the one. I now own the domain name and have it on wordpress (as opposed to formerly on blogger). With that being said, I have more invested in this and I am committed to making it a place that hopefully will be worthwhile for you to stop by and leave a comment every once in a while. Since this is a new space, I ask that you RESUBSCRIBE via RSS feed if you had already done so on the previous site. This will ensure that you will be up to date with the latest posts. It looks like if you were an email subscriber previously than it will still work on this new site. Let me know if this is also true for RSS subscribers. If you are a new visitor, a special welcome to you and if you like what you see, I encourage you to subscribe through the links listed on the right as well. Last week was the best week ever! Because I got to drink soda, go in a hot tub with bubbles, and I got to jump in the pool, which was fun. I went to a Children’s Museum in Indianapolis that had Barbie and Dora and it also had where you could visit like a world and you could like also see dinosaurs. I also got to eat pizza with chocolate milk. And I got to go to another children’s museum in Louisville. I like the dancing thing that played a song “I like Julia” and you had to do the steps along with it. And I went to South Carolina State Museum that had an old school house and you got to go on a choo choo train. They also talked about slavery, which means you had to work for people very hard and you didn’t get paid or anything. They also had a fun part where you could climb a treehouse and see stuffed animals there. Save on shoes, accessories, handbags and apparel at Shoebuy.com. We’ve got something for everyone and for a limited time, you can save $10 on that special something. Valid on purchase of $50 or more. 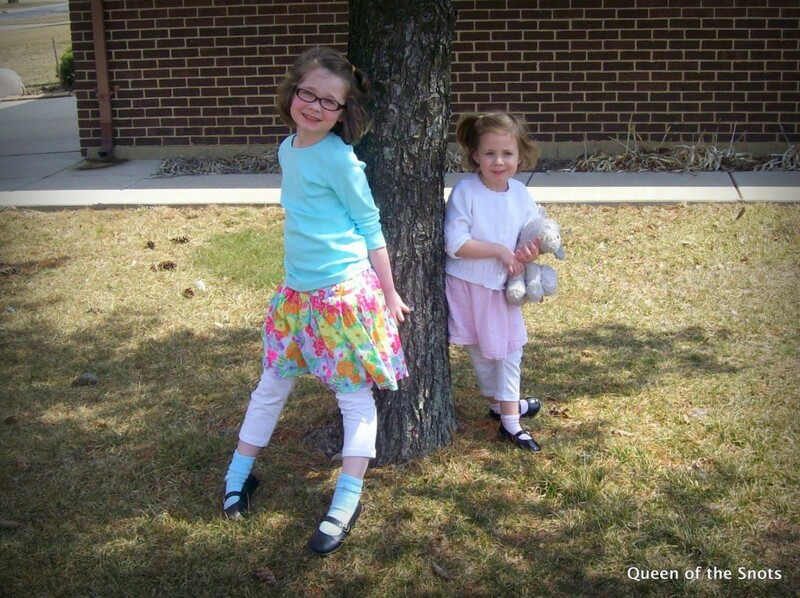 So why is this blog called “Queen of the Snot Princesses?” The reason is simple. Miss M loves all things “princess” and Baby C seems to always have a runny or rather “snotty” nose. Thus the name “snot princesses.” It is not because I think my girls are snotty. Far from it. They just have a tendency to be full of snot more times than not. I guess they get this lovely genetic trait from their mother. The Queen.